Set in a hellish outpost known as Enemy Mountain which you must escape from, this modification features my interpretations (rather than recreations) of Ultimate Doom maps. 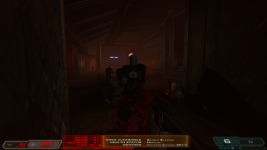 Expect fast-paced, old-school gameplay, randomized monsters and items to add extra replayability, and alternate fire modes on the stock Doom 3 weapons, including proximity grenades that detect monsters as well as players. There will also be full-on monster infighting- even monsters of the same type can be lured into attacking each other. 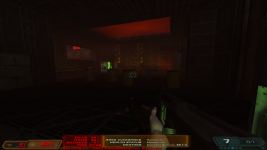 A modified HUD and level stats system will add to the retro classic Doom-style feel. The next release will consist of four maps, the start map and then E1M1, E1M2 and E1M3. The scope of the mod is open-ended, but I certainly hope to at least complete Episode 1. I soon realised that my previous version of the modification, with some use of props from the Dark Mod, wasn't going to be workable, for quite a few reasons, one of which being that the Dark Mod's props do not work with the "Ultra Quality" setting. So, late last year and early this year, I had another re-think about where I wanted to go with this modification, having had so many "resets" and failed planned releases. Inspired by the idea of the Automatic Map Builder for Doom 3 (discussed over at the Grimm mod) I spent the early to middle part of this year creating props, prefabs and definitions lists to try and increase the level of automation of the map-making process. I have to admit that for most of the time, I have been slowed down by the often-laborious process of laying out the brushwork and creating props manually, etc. I also downloaded numerous textures from CGTextures.com for use in the mod, since I am more interested in the hellish themes than the techbase themes and the hell texture set in Doom 3 is comparatively limited. Some of them give off a more Hexen-esque feel than a Doom-esque one, admittedly, but I don't see that as a problem as I am a big fan of the atmosphere and level design in Hexen (just a shame about the hub system and switch-hunting). My progress was also slowed by the demise of the Doom3World.org forum, which made it harder to find advice on setting up props etc., but by August I finally had all of the props in place. The props include a much-expanded range of moveable objects and snack/drinks machines with GUIs that give you health, based off the healthstation GUI. I always thought it was odd that you couldn't get drinks from the vending machines considering that it had been a common feature of first-person shooters since at least Half-Life. In addition I scatter some GUI-based "signs" around the map that contain "Easter eggs" such as references to the infamous Start-to-Crate map ranking system- I won't reveal anything more about these as they may be spoilers. I have also changed the HUD slightly, where the health area turns from white to yellow, orange and red as your health drops, and level stats are displayed in the middle of the HUD- kills, items, secrets, area location, and info about the extent of your area clearance and health status (which takes armour as well as health into account). I also had some indecision about what to do with the monsters and the weapons. In the end, I haven't changed the weapons from how they were previously, with the stock Doom 3 weapons plus some additional alternate fire modes (e.g. proximity grenades in addition to the standard grenades). The monsters still use some randomisation based on Ivan_the_B's random monsters scripts, where I have created custom lists of particular types of monster and item to randomise between. I have also set it up so that each monster has a different "team" number, so monster infighting is possible even between monsters of the same type. Which is useful for players, since the monster counts per unit area are often higher than in vanilla Doom 3. Randomisation continues to add some replayability and variety to the gameplay. On the sounds/music front I am going for some ambient music (from a combination of stock Doom 3 and the Dark Mod) and remixes of Ultimate Doom/Hexen tracks for action sequences, which I got permission to use some years back. 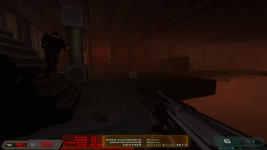 I am going for smaller, but more numerous, and more action-packed maps, increasing the extent of the "old-school" feel, and other than the start map (Cells) the maps are essentially my interpretations of the Ultimate Doom maps (but not recreations as per Classic Doom 3 or Doom Reborn, and there are some nods to Hexen in there as well). My progress is going a lot faster than before- since June I have completed two maps (the cells map and E1M1) and am close to completing E1M2. The aim is to come out with a four-map release once I have completed E1M3, which will, in line with E1M1 and E1M2, be my own interpretation of the Toxin Refinery. My current assessment of the scope of the mod is "open-ended". I certainly hope to complete Episode 1 at some point in the near future, but will have to see if I feel like taking on Episodes 2, 3 and/or 4. It depends on how easy it is to churn out high-quality maps quickly and on how much "real life" gets in the way, but the time invested earlier this year in creating props and automating some of the more laborious aspects of level design appears to be helping significantly. A release is coming very soon- but I have a query regarding the sounds. Work is continuing, albeit slowly, on the upcoming demo release. Apologies all, but this mod is dead (if you hadn't already guessed). The mod went through Duke Nukem Forever-esque development hell, and then I got a full time job, which reduced the motivation to keep going. 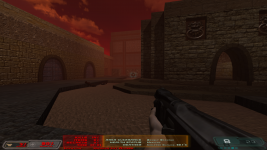 I haven't left the modding scene though, but have been experimenting instead with the classic Doom games and Hexen which are less labour-intensive to mod for. This looks pretty badass. This and In Hell should surely keep me busy. I mean personally, I feel as if the Hell portion of Doom 3 was lacking. And heck we were confined in labs for half the time. There were no military bases, hangars, toxin refineries, computer stations, and geological anomalies. Instead, it was just generic lab after generic lab. Heck it wasn't even like Phobos Lab or Deimos Lab. 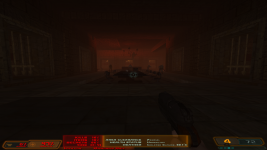 I really like this, it looks like Doom 64 a bit. :D Doom 64 is my favorite Doom by the way, if it's not that then it's Doom 95 for the Windows 95 which I played the crap out of when I was a kid. Would like to apologise to everyone for the lack of updates after having promised so much. Work on the mod slowed down somewhat (with having a PhD to finish etc). But no, the mod isn't dead, and hopefully the next release will offer rather better gameplay than Duke Nukem Forever. I won't make any promises for the next release bar "when it's done", but will be releasing new screenshots shortly. As compensation there is rather more to the mod than in the previous release, with alternate fire modes and enhanced capabilities for many of the weapons fully implemented and working. But I can assure you all that the mod isn't dead, just progress slowed down somewhat earlier in the year due to having a PhD to finish and other issues. The 4-5 map release is deferred to early 2012. I'm hopeful that the next release, despite all the delays, should be better received by the community than Duke. I should add that the next release is set to contain three large, fully playable maps (again the monster randomization will help increase replayability). Skill levels are now implemented, to mean that monsters are spawned with slightly lower frequency at lower skill levels. I won't give too much away but Map 2 is strongly Hexen-themed, which will give you another bout of Hexen-nostalgia (I say "another" because Hexen Edge of Chaos looks like it's due a release very soon). Can't yet commit to a definite release date for the forthcoming release but it is highly unlikely to fall beyond the winter quarter of 2010/11. Apologies for the lack of updates/info- the mod isn't dead, I'm afraid progress slowed quite a lot in the middle part of the year but I'm back working on it now, I hope to bring an update out soon.